Enjoy the sunny Los Angeles weather as we take over the parking lot at Link N Hops and 55 Degree Wine to bring you live entertainment, over a dozen local craft breweries, wine tasting and a variety of local vendors. It's a dance party, beer fest, wine fest and neighborhood block party all in one! Atwater Village has become a craft beer destination with a brewery and several great craft beer restaurants - Link N Hops has been on the forefront with over 20 taps of craft beers. We're bringing a lot of great local craft breweries to introduce their flagship beers as well as new and exciting brews. Local breweries Angel City, Golden Road and Wolf Creek will be on deck, along with a few breweries new to the festival like Boulevard Brewing, Belching Beaver, Bravery Brewing and more. Sonoma Cider Company will also be the first cider brewery to attend the festival. 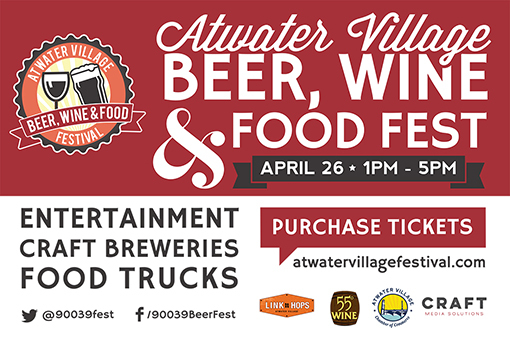 The Atwater Village Festival takes place on Sunday, April 26 from 1:00 pm to 5:00pm. A ticket gets you entry and 15 drink tickets as well as a commemorative glass. A VIP ticket gets you early entry, a gift bag and unlimited tastings. Andy Hasroun, owner of 55 Degree Wine and Link N Hops in Atwater Village, is extremely excited to make history in Atwater Village with this festival. Tickets are selling out fast, so attendees are encouraged to purchase tickets online in advance at the website.